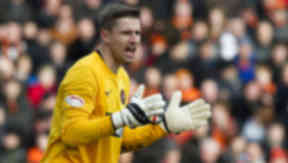 The Polish goalkeeper has signed on at Tannadice until May 2015. Dundee United goalkeeper Radoslaw Cierzniak has signed a contract extension to keep him at the club until May 2015. The Polish goalkeeper joined United last summer and has played 36 times for the Terrors so far this term. He originally signed a two-year contract but has now decided to extend his stay on Tayside by another 12 months. Cierzniak told the club’s official website: "I enjoy playing for Dundee United very much and, having settled in the area, it is an easy decision for me to sign on for a further year. "I came here to improve as a player and I feel I am doing so. The club, players and supporters have all helped with this and I look forward to exciting times over the next few years at Dundee United." United boss Jackie McNamara added: "This extension is merited because Rado has shown that he is an excellent SPL goalkeeper. It can sometimes be difficult for a foreign player to come into a club and settle but he has done so superbly. "He is a very good shot stopper and in my time here has shown some excellent aerial handling skills. It is a bonus for him to know his future is secure until at least May 2015 and it is great for us to know he wants to remain a United player until then also."